Justice for Magdalenes Research is calling on the government to help organise the event. 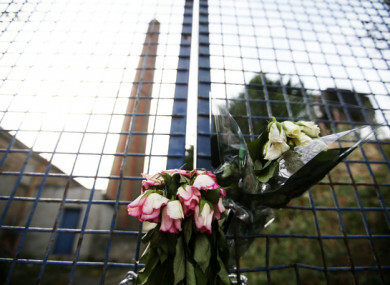 Flowers hang on the gates of the site of the former Magdalene Laundry in Donnybrook. A CAMPAIGN GROUP set up to support survivors of the Magdalene Laundries is appealing for help funding a two-day event in Dublin later this year. Justice for Magdalenes Research plans to bring together around 200 women who spent time in the laundries at the Mansion House on 5 and 6 June this year. The group is also calling on the government to help bring the survivors together. “Time is of the essence here as these women are getting older. “In his redress report in 2013 Mr Justice Quirke recommended that a gathering takes place before more of the women die. We are simply asking the Department, which holds all of the contact details, to invite them on our behalf. Lord Mayor of Dublin Míchéal MacDonncha, a Sinn Féin councillor, announced at a meeting of Dublin City Council last night that he would hold the event for the women at the Mansion House. The Council’s Central Area Committee has agreed to contribute towards the cost of the two-day event. JFMR said the women would discuss how they’d like their experiences are to be officially remembered at the two-day event. “These women don’t have any more time to wait,” Maeve O’Rourke of JFMR said. “One of the reasons for this important gathering in June is for the women to start a conversation on memorialising what was a dark chapter in Irish history and in their lives. Businesswoman Norah Casey, who is an ambassador for the event, said it now needed lots of further support. “In practical terms we need to fund two nights for the estimated 200 women who will attend,” Casey said. That involves hotel accommodation, a dinner with entertainment on the night of 5 June, and time and space for the women to talk and discuss how they would like to be commemorated on the sixth. TheJournal.ie has contacted the Department of Justice for comment. In a statement to RTÉ the department said it had not been notified of the event by the Lord Mayor’s office or by Dublin City Council but that assistance would be ”offered if requested”. Hello Barbie, surely this meeting should be funded by caranua these women are survivors just like the rest of us I bet caranua is aware of this and is hoping the funding will be coming from the public. you are so right! However, Caranua does not want to fund any survivors they are like Scrooge in the movie/story of Oliver Twist.